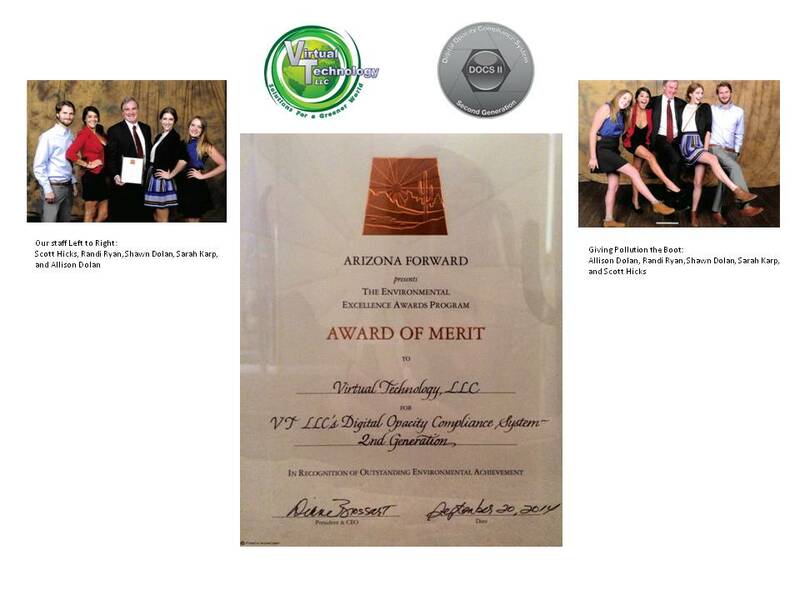 Virtual Technology LLC was founded in 2006 by Shawn Dolan a 30 year veteran of the sustainable technology market. Over his career Mr. Dolan has been involved with a number of enterprise level Environmental, Safety, and Occupational Health solutions known throughout the Department of Defense. Mr. Dolan pioneered the concepts of integrating regional monitoring data with reported emissions data to find opportunities to reduce pollution, while maintaining a growing economy and the comforts American’s are accustomed to. While working with many southwestern states to enact and institutionalize Air Quality monitoring networks, Mr. Dolan realized that a significant data quality issue existed with the measurement of visible emissions in terms of Opacity. While most all pollutants had been defined in terms of their “Signatures” which in turned allowed for automated means to measure the amount of a given pollutant in the ambient air, nuisance “visible” emissions” which accounted for over 85% of Air Quality complaints is today still monitored exclusively by a highly subjective human observation method. Method 9 as this human observation method is known, was developed in the late 60’s and continues to this day to be the primary means to determine if a visible emission is within compliance of permitted opacity limits. In 2006 Mr. Dolan started Virtual Technology LLC, as a pioneer of Local compliance focused monitoring techniques as well as regional, national, and international impact assessments as relates to Hazard Mitigation and Sustainable Infrastructure. VTLLC was awarded its first Research and development contract with the US Department of Defense in March of 2006. This R&D effort was targeted at developing automated monitoring technology to measure and document opacity values of visible emissions. This project continues today through a series of Federal grants and has become the second generation Digital Opacity Compliance System or DOCS II. DOCS II is the main product offering in Mr. Dolan’s Visible Emissions Service Business Unit. VTLLC added Pat Grieco to its membership in March 2006 because of his in-depth knowledge and experience in the Geographic Information Systems (GIS). VTLLC needed to enhance the DOCS II spatial capabilities to correlate various coordinate systems and projections utilized by Federal, State and local governments with Global Positioning System (GPS) based location information. Various R&D projects resulted in a WMS open source library approach to enable use of standard maps and data. The project continues today through VTLLC’s Spatial Services Business Unit with the vision of participating with and defining new interactions with the Global Earth Observation System of Systems (GEOSS) initiative administered through the Department of State and the United Nations. Mike Bilbro was added to the VTLLC membership to solidify the third leg of the stool, i.e. the hands on implementation and execution of sustainable infrastructure. Mr. Bilbro, a 40 year veteran of the construction industry, has built everything from livestock rotation facilities, water treatment facilities and “adobe” construction to high-rise office buildings, fire stations, schools, and freight forwarding facilities. VTLLC has been awarded many sustainable infrastructure projects including: high thermal mass adobe (with solar/wind powered off grid capable) beach houses; Solar power and storage units; Geothermal environmental control. These projects continue today and have been credited with improving water, and air quality (to maintain demand), while evolving building codes and construction methods that have reduced the need for coal fired electric power. The sustainable development division of VTLLC has now installed and operationalized over 10 megawatts of solar power, 2 megawatts of wind power, and 8 megawatt equivalent of geothermal conditioning. Together, Mr. Dolan, Mr. Grieco and Mr. Bilbro represent the founding partners of VTLLC. Mr. Dolan in addition to his duties as President and Chief Financial Officer, leads the Visible Emissions Service Business Unit. Mr. Grieco is the Chief Technology Officer and leads the Spatial Services Business Unit. Mr. Bilbro in addition to his duties as the Chief Operations Officer, leads the Sustainable Services Business Unit. Each of the founding partners have extensive experience in their respective business areas as well as deep friendship and trust with the other partners. This unique combination of expertise and collaborative interaction makes VTLLC a company that can address critical engineering problems and implement cost effective solutions in each of our specific business specialties; Visible Emissions Service, Spatial Services, and Sustainable Services.